Next Monday will be the first trading day (FTD) of November. 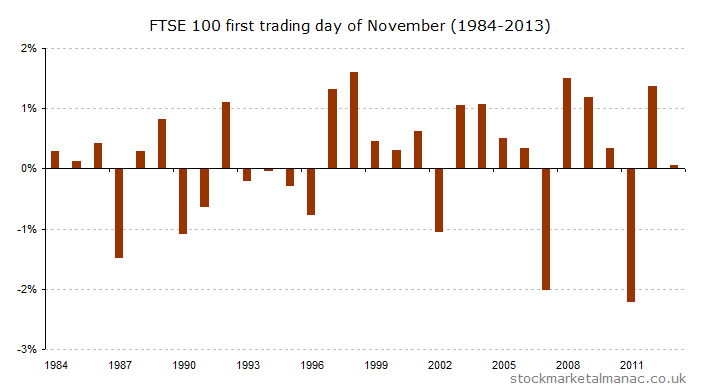 Since 1984, the FTSE 100 Index has risen on average 0.17% on the November FTD. The index has had a positive return on this day in 67% of years since 1984. Since 2000, the performance has been a little stronger on the November FTD, with an average return of 0.2% on the day, with positive returns seen in 79% of years. This entry was posted in Day analysis, Market, November and tagged FTD, FTSE 100, November, UKX by Almanacist. Bookmark the permalink.